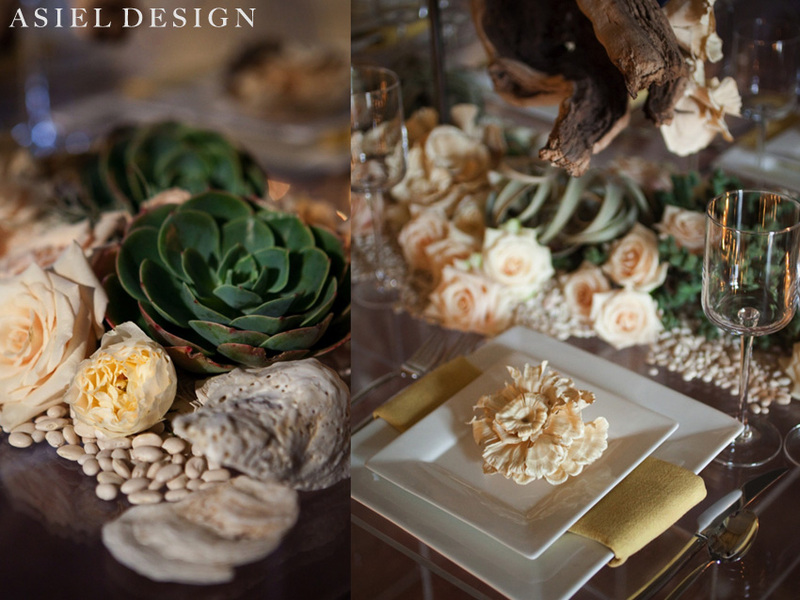 Many people often ask us “where do we get our design inspiration from?” For this shoot we had just finished a VIP party for the president of the St Regis Hotels. They were asking for a residential and bespoken design that would be in line with their brand. 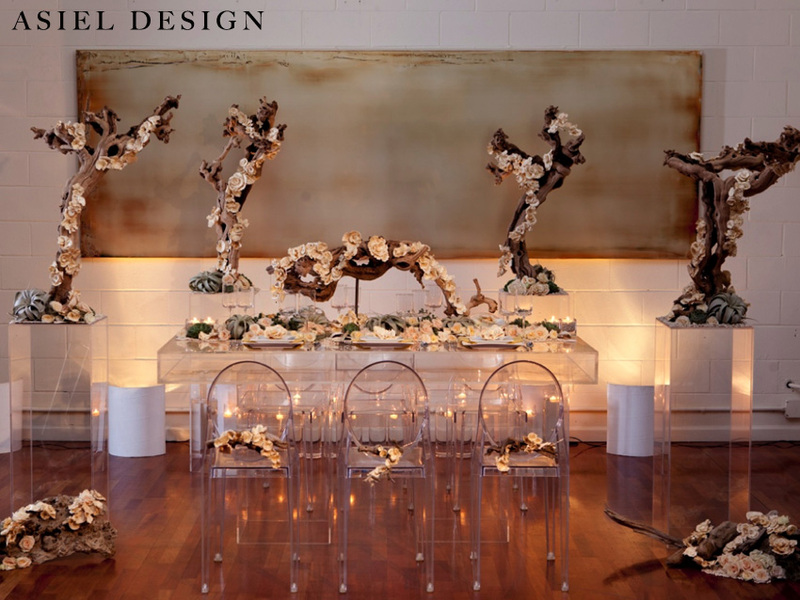 A lot of the sculptural pieces featured in this Grace Ormonde shoot were recycled out of the St Regis event. We have been advocating and promoting sustainable designs for a number of years now but how would that translate into the Grace Ormonde publication? For those who are not familiar with the Grace Ormonde magazine, it is kind of the standard for “over the top” design for weddings. 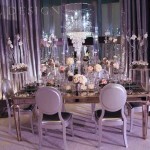 Many of the designers that are featured are well known or celebrity event designers. 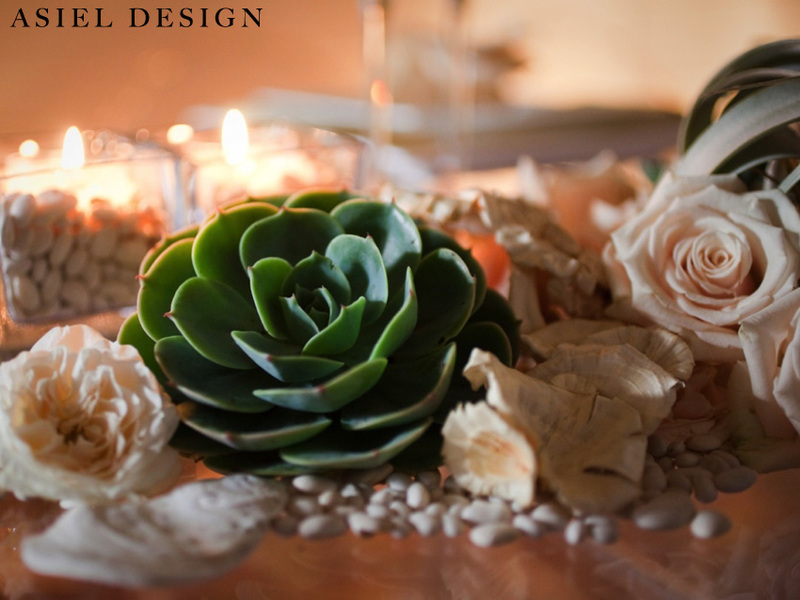 It is not uncommon for a designer to spend thousands of dollars and numerous hours to design a tabletop that MAY have a chance of “gracing” the magazine. We have worked with Grace for a number of years now (since 2006) and know that she wanted to have designers approach design differently by thinking outside the box. 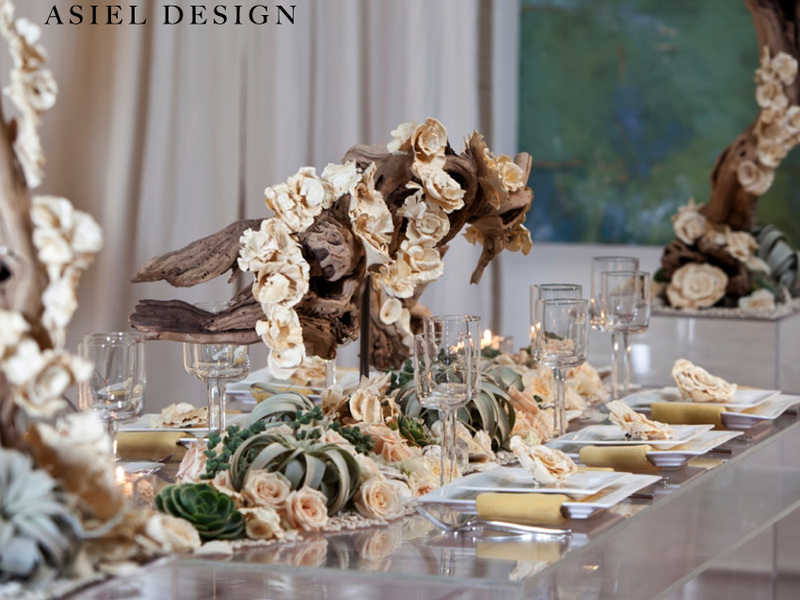 To approach a table like this with sculptures and succulents was still a risk. Now about what we did: Essentially our biggest focal points were our wood structures. We mounted them on metal rods to give the effect that the sculptures were to be admired as if they should be viewed as an exhibit at a museum. 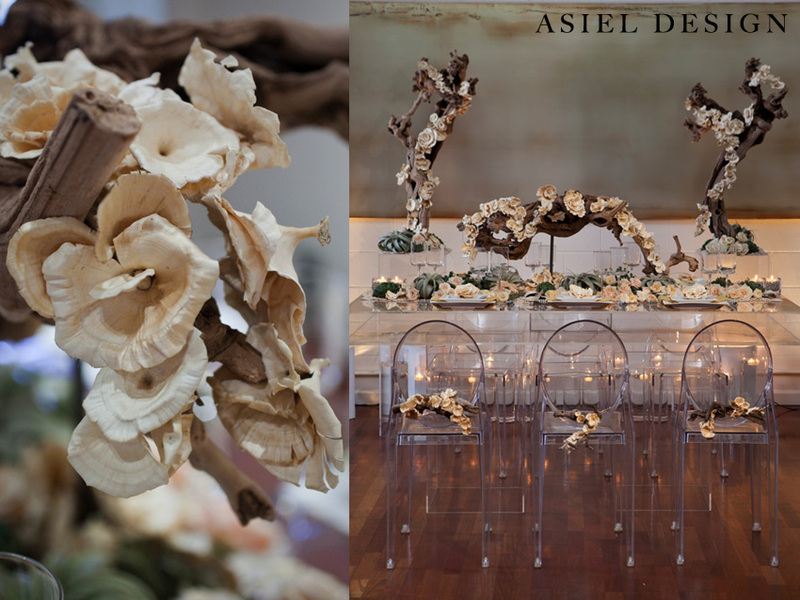 The crustacean looking pieces on the sculptures are actually bleached mushrooms. They are a design element that we are using regularly now in a number of our floral designs to give an unexpected texture. 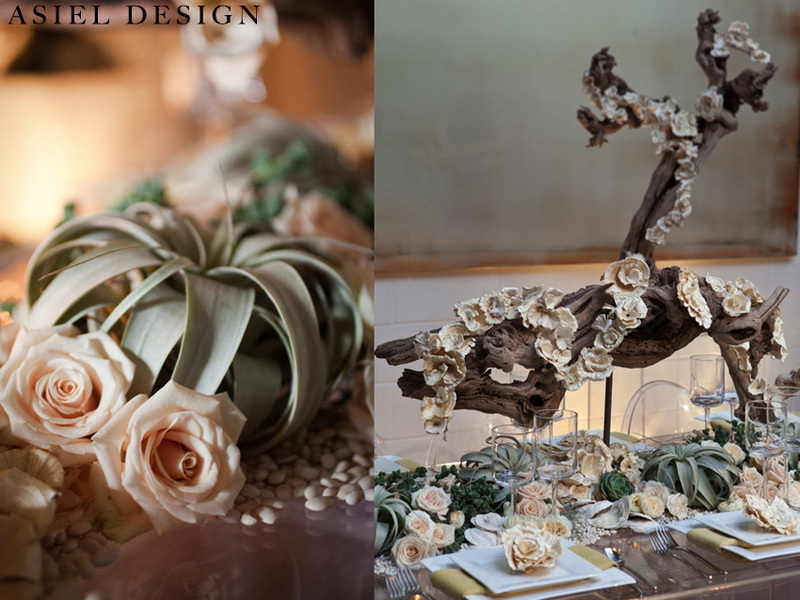 We also used oversized air plants to create focal points at the bases of our sculptures, followed by succulents, oyster shells and white beans. 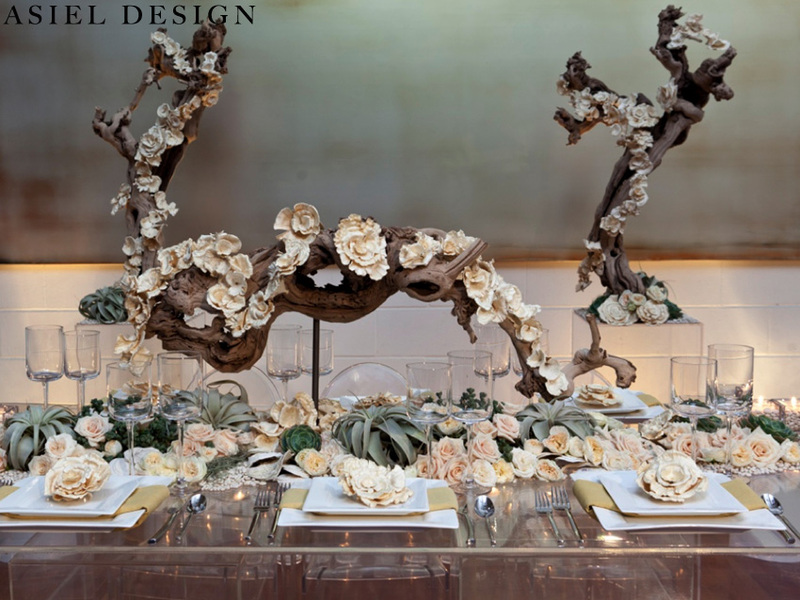 This design was not 100% sustainable as we did use some Ecuadorian and garden roses but for a Grace Ormonde shoot we did a pretty good job at being sustainable. Finally we used Plexiglass pedestals and even a Plexiglas table. Again this enhanced the museum vibe and kept the design ultra clean. 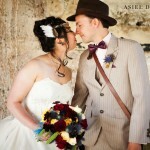 Also working with a fabulous venue and fabulous people enabled this shoot to be a success. Terra Gallery, SF hosted us and was perfect space that boasts an art gallery and event space in one. 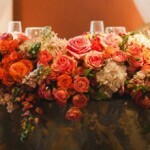 Catherine Hall Photography was professional and did a great job capturing the essence of the design. In the end we were happy with our little creations. I think Grace was happy too because she picked it up. Thank you Grace for doing that and supporting us as designers. This entry was posted in Cream, Green, Green Events, Green Weddings, Modern, Photo shoots, Residential, Steampunk, Terra Gallery, Trendsetting and tagged Burning man, Catherine Hall, Catherine Hall photography, Grace ormonde, green events, green weddings, Modern floral, Modern floral design, Modern wedding, Modern wedding Design, Opulent weddings, pink wedding, Plexiglas, Plexiglas wedding design, Plexiglass, Residential floral design, Residential wedding, Residential wedding design, Sculptural wedding design, St Regis, St Regis San Francisco, St Regis VIP, Sustainable design, Sustainable floral design, Sustainable wedding design, Terra Gallery, Terra gallery SF, travel, Wedding, Wedding Designer San Francisco, Wedding designer San Jose, wedding flowers, white wedding, White weddings. Bookmark the permalink.